In a dynamic ecosystem where climate swings can eliminate sources of food and bring out predators, your species must adapt to survive. Give your species a Long Neck to get food that no one else can reach, evolve a coat of Heavy Fur for protection against the bitter Ice Age, or grow Horns to dissuade packs of Carnivores from making you their next meal. 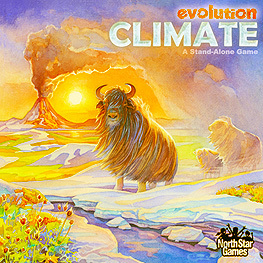 With over 200,000 ways to adapt your species, every game of Evolution: Climate unfolds in a beautifully unique way. So gather your friends and see who best adapts to the changing world around them.